Maximizing the display of information while finding balance. The laptop I work on has a resolution of 2,880 x 1,800. I have 5,184,000 pixels worth of potential information available to me. Many of these pixels are working together in groups to visualize elements of the operating system’s user interface. As you read this many of your pixels are displaying a browser window and the content of this page. At any given moment a screen can be divided between the areas used to display information and the unoccupied areas (white space) around that information. 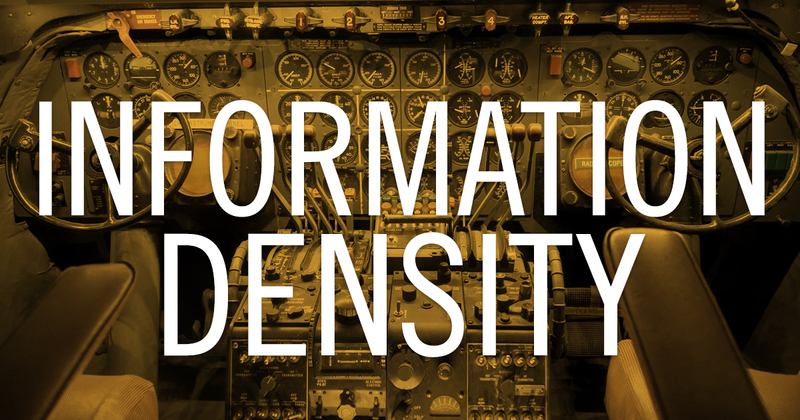 “Information density” is the amount of information you have in a given space. Jakob Nielsen recently commented of websites that while screen sizes have increased, information density has decreased. We have more space to use but given the current trend in minimalistic design we are putting less information on the page. BI doesn’t necessarily follow this design trend in the same ways that websites do (big photos, overlay pop-up layers, etc. ), but information density is absolutely just as important as it is on the web. We want to maximize information density while also maximizing the user’s ability to complete tasks. Sometimes just one very information dense chart on a page can be enough, while other times you will want lots of charts and objects. It’s about finding the right balance between information and white space to help users get the most out of the page while avoiding information overload. Many experienced users will find higher information density to be a better experience because it gives them more information and more control. Novice users on the other hand will find a simpler UI easier to get them started. For example, think of the contrasting levels of information between an airplane cockpit and the dashboard of a car. The high level of skill an airplane pilot has, combined with the amount of control needed to fly a plane, necessitates a cockpit with a very high information density. Because of this high information density, the cockpit of a plane looks daunting to the inexperienced user. Meanwhile, a car’s dashboard provides just summary information because most drivers are not very knowledgeable about cars and generally just need to know the basics to be able to drive. This level of information density is very low and not nearly enough to solve real problems. For example: the Check Engine Light only alerts you that there is a problem but offers little information beyond that. BI applications, like websites or vehicles, need to offer the amount of information that is appropriate for the intended audience. Skilled analysts will want a higher level of information density - lots of charts, filters, tables, etc. Casual users will want a dashboard app that gives the general idea of things in a few basic KPIs and charts. Attempts to combine the two, offering full control while appearing to be very simple, generally rely on progressive disclosure and moving advanced features inside dropdown menus or toolbars. Edward Tufte has criticized task menu bars because of the fact that they hide information, lowering the overall information density. Ultimately if one were to choose between making an app with too high or too low information density, I would err on the side of too high. It’s better to offer your users a higher amount context & control than not enough. Don’t underestimate your audience; with time we can all learn to navigate and use an app that has a high degree of information density instead of trying to gain insights from an app without enough.